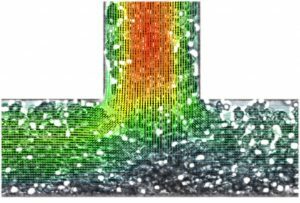 We have experimented extensively with flows past cylinders and cylinder arrays looking at the flow field and vortex shedding characteristics in flows past staggered and in line arrays of cylinders. 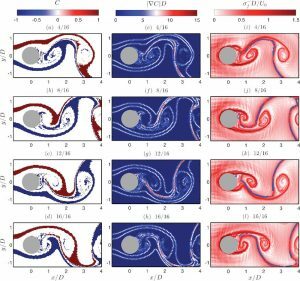 We also looked at the effects of external flow forcing on the wake of a single cylinder and cylinder arrays (Konstantinidis et al 2004, 2005, 2007) and explored the possibility of using flow oscillations as a process intensification tool. 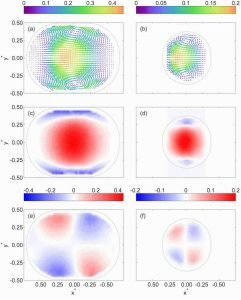 Our forced oscillations work shed light to a number of fascinating phenomena such as lock in, vortex shedding modes and mode switching and subsequently gave rise to research into vortex induced vibrations. 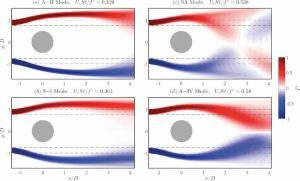 Our work in this field focuses primarily on streamwise cylinder oscillations.Using time resolved PIV techniques we have been able to simultaneously capture the amplitude response and wake modes of the oscillating cylinder for a range of reduced velocities. We have extended this work to include the effect of a second degree of freedom on the measured response. Our current research focusses on the effect of body shape as well as the onset of vortex shedding under confinement (i.e. in confined flows past micropins ). Our interest is in haemodynamics in physiology and disease. Our work covers both the macro and microcirculation. We conduct in vitro experiments to understand blood flows in disease and develop biophysical markers and diagnostics for disease. Our macrocirculation work deals with aortic dissection. By working closely with clinicians we recreate physiological blood flows in the lab. 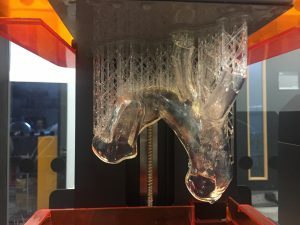 We combine these with anatomically realistic 3D printed phantoms of dissected aortas obtained from patient CT scans and optical flow diagnostic techniques such as PIV to resolve the flow characteristics of the dissection. This information will help us understand disease progression, aid clinical intervention decisions and also inform and validate numerical modelling (CFD) approaches for personalised medicine. To better understand microvascular flow phenomena we have developed in vitro approaches combining microfludics, microPIV techiques and advanced image processing techniques to study RBC transport in small channels with application to physiology and disease. Our interest is on the effects of RBC aggregation and deformability on microhaemodynamics. Mixing is ubiquitous in nature and engineering. Understanding transport phenomena can aid the design of processes and manufacturing. 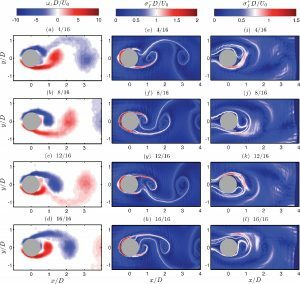 Our research focusses on quantifying mixing in vortical and swirling flows using PIV/LIF techniques. We are applied these techniques to study intra-and inter vortex mixing in Taylor Couette flows (Dusting-Balabani, 2009; Imomoh et al 2010), mixing through oscillations (Cagney-Balabani, 2016) as well as micro droplet mixing processes for diagnostics (Ma et al 2014, 2015). We currently extend this work in non-Newtonian flows. 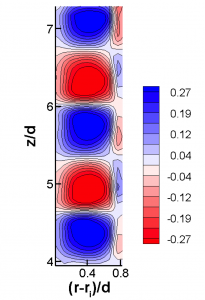 Concentration fields (firsct column), concentration gradient (second column) and Finite-Time Lyapunov Exponents in backward-time in the wake of streamwise oscillating cylinder (Cagney & Balabani, POF 2016). 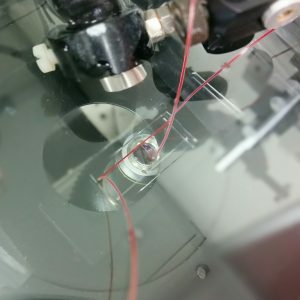 Our work focusses on structured fluids such as particle suspensions, and in particular on linking the microscopic behaviour of such suspensions to macroscopic flow behaviour. RBC suspensions. The majority of our work has focused on cellular suspensions, particularly RBCs flowing in micro channels. 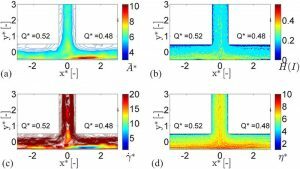 Using idealised microfluidic geometries to mimic microvascular bifurcations, μPIV and image processing we have simultaneously characterised the flow field and cell distribution in bifurcations in the presence of aggregation (Sherwood et al 2012, 2014). Images of aggregating blood flowing in a sequential bifurcation 50 um x 50 um with measured velocity and hematocrits profiles in parent and daughter branches respectively (Sherwood et al PLOS One, 2014). 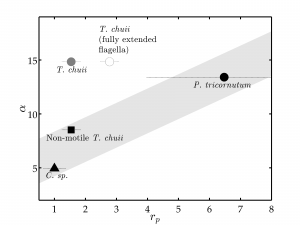 We have also quantified RBC aggregation (Kaliviotis et al, 2016) and obtained a distribution of aggregate sizes (Kaliviotis et al 2017) and local viscosity (Kaliviotis et al 2018). Aggregate size distribution, haematocrit field, shear rate distribution. and estimated viscosity distributions (Kaliviotis et al PoF, 2018). Algae suspensions. Microalgae are diverse microorganisms that vary in cell morphology and motility. We are interested in the rheological behaviour of algae suspensions and its impact on downstream processing of algae biomass. Working closely with with Dr Mike Allan form Plymouth Marine Laboratories we have investigated the effects of motility and morphology on rheology by looking at flagellated (Tetraselmis chuii) and high aspect ratio species (Phaedodactylum tricornutum) in comparison to round, non motile species (Chlorella sp). We have also explored the use of a swirling flow separator for downstream processing of algae. Complex formulations-Particle suspensions in non-Newtonian media. We are currently extending our suspension work into the study of dense particle suspensions in complex formulations. We are interested in particles suspended in non aqueous, non Newtonian media and in particular the link between microstructure and bulk rheology. We also look at the mixing behaviour of such formulations through the use of idealised mixers such as the Taylor-Couette flow. 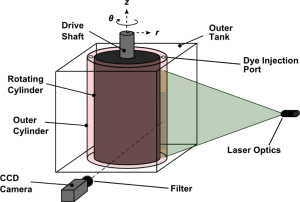 We use a suite of techniques for this work involving rheology, rheo-optics and PIV. The work is part of a large EPSRC Future Formulations programme in collaboration with UCL Chemical Engineering, UCL Mathematics. Our work focusses on the development and characterisation of fluidic systems for point of care diagnostics and drug delivery applications. For example, we have studied the flow inside microdroplets, explored the microenvironment and the deformation of compound droplets under sheath flow focusing conditions relevant to cell encapsulation, in collaboration with Dr Shaohua Ma and Prof Heck. This work has featured on the cover of Lab on a Chip. 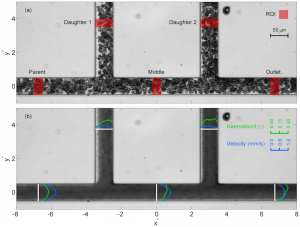 Flow inside microdroplets in rectangular microchannels (left, Ma et al 2014) and compound droplet deformation in a hydrodynamic focusing device featuring in cover of Lab in a Chip (right, Ma et al 2015) . 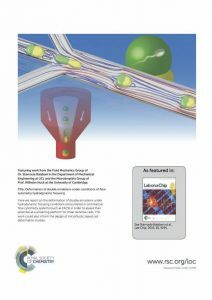 More recently, in collaboration with two different groups, UCL Division of Surgery (Dr Wenhui Song) and University of Cape Town (South Africa) we combined microfluidics with various types of hydrogels to study the micro flow characteristics of novel injectates for tissue engineering applications.